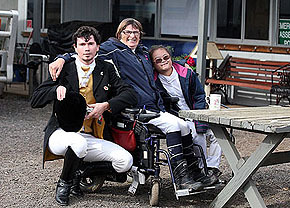 A newly formed group known as Aus Para Power recently got together at Catherine Shelley’s Melton Equestrian Academy to begin preparations for the World Equestrian Games in Normandy, France in 2014 … and looking further ahead to the next Olympic Games in Rio, 2016. Aus Para Power spokesperson Jan Pike emailed and asked if I would like to attend one of the two training and assessment days at the end of May 2013? As I know that this is a dynamic and inspirational group, I was delighted to be part of this inaugural and innovative session. 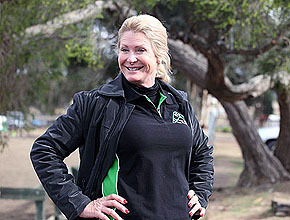 On the back of the outstanding success of Australian Para rider, Joann Formosa, at the London Olympic Games, the “Para Equestrian” movement has really gathered momentum and found direction, with many more riders now involved. Because of the number of helpers required, there was a large group of people participating and they travelled great distances to be at the Melton Equestrian Academy to take advantage of this very positive and beneficial initiative. 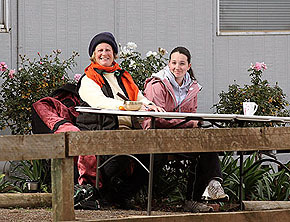 Right: NSW riders, Dale Spring, Jan Pike and Sui Watts share a happy moment after their assessment rides. Catherine Shelley, the Melton Equestrian Academy’s proprietor is well known for her generosity and support and she has given Jan Pike a great deal of assistance … and the ride on her wonderful 7 year old ex-racehorse Pinky, who is indeed a very special equine. Pinky has an amazing temperament and shows a human-like understanding of Jan’s physical difficulties. Left: Catherine Shelley is well pleased with the success of the two day clinic. Jan was born with Cerebral Palsy and has very little physical strength and co-ordination. The patient and knowing grey seems to understand that some of Jan’s movements are involuntary and do not mean anything, while others are the influences that he should listen to, in order to perform a dressage test with her. “I would also like to thank everyone who took part over these two days and of course their helpers, the judges and clinicians who gave the riders such valuable feedback and advice to help with their preparations for the up-coming qualifying competitions. This format has been very well received, it is a first of its kind and surely not the last.” said Catherine. “Mary Longdon (Victoria) and Nell Marshman (NSW) judged and gave a detailed critique to each rider and we were very grateful to Helen Heagney for attending and talking to the riders on the final day.” Catherine explained. The team spirit, joy of learning and improving was very evident and Australia is set for a very bright future in this relatively new arm of equestrian sport.